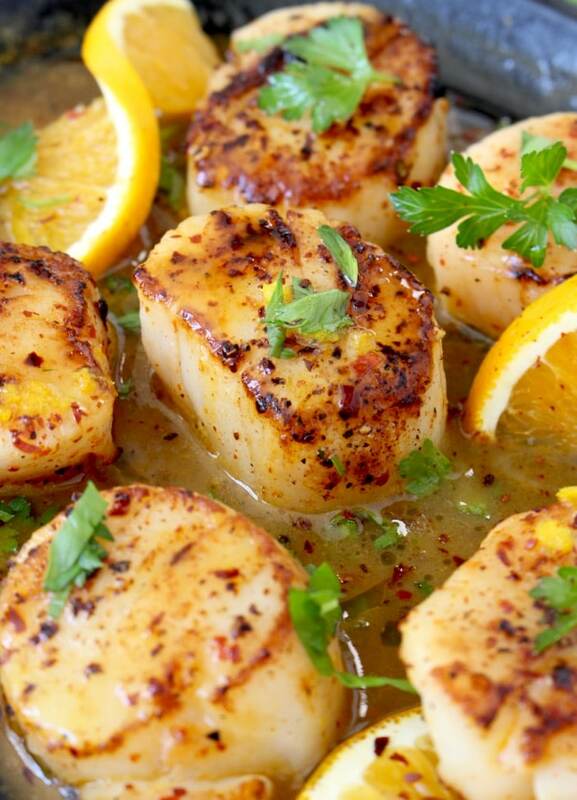 Quick and easy seared scallops recipe with a silky orange rum and butter sauce. 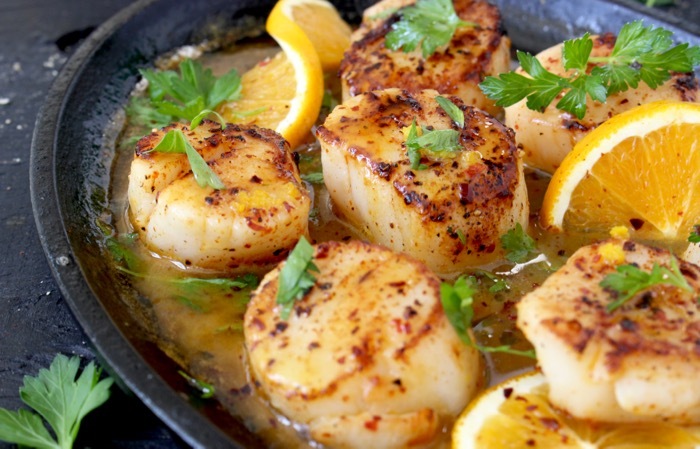 Tuesdays are for easy dinners like this pan seared scallops recipe I whipped up for us today! 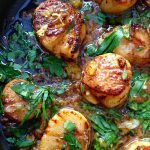 Perfectly seared in my cast iron skillet, these wild scallops are swimming in the silkiest orange rum sauce, made right in the same pan. I came across some gorgeous wild scallops at the market and I just couldn’t resist grabbing some. They aren’t only delicious and nutritious, but also incredibly fast to cook. And fast is great! You will need a cast iron skillet to execute the perfect searing! No way around it you guys! Make sure to dry the scallops very well on paper towels and remove as much moisture from them as possible. This is crucial in getting that golden brown sear without overcooking them. Nobody wants chewy, rubbery scallops, right? yikes! Season well with sea salt, black pepper and red chili flakes. 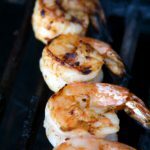 Also, don’t forget to add a dash of chili powder not just for flavor, but also to help with that gorgeous golden seared color. Sear quickly on a hot surface. 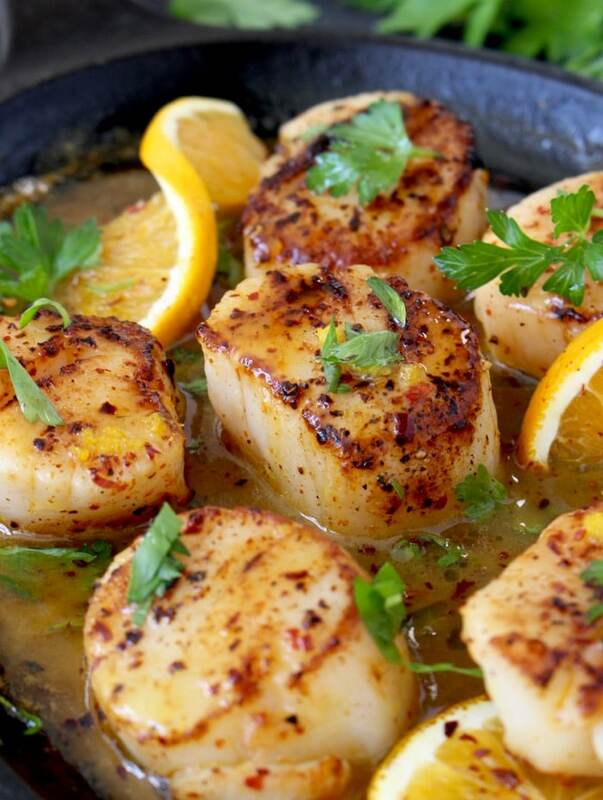 Make sure that pan is hot and ready to sizzle the moment your scallops touch it. 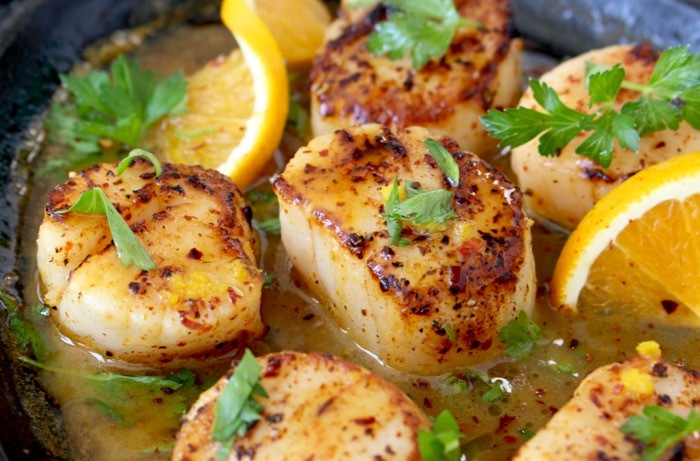 It shouldn’t take more than about 30 to 45 seconds per side for large scallops. Last but not least: make an exquisite sauce by deglazing the pan with a splash of rum and freshly squeezed orange juice. Pat the scallops dry on paper towels. Drizzle the scallops with a little olive oil and sprinkle them all over with sea salt, chili powder, red pepper flakes and freshly cracked black pepper. Toss to coat well. Preheat a cast iron skillet on medium flame until hot. Add a lug of olive oil, just enough to coat the bottom and sear the garlic cloves until golden on both sides, making sure not to burn them. Remove from the pan and set aside. Using a pair of tongues add the scallops to the hot skillet without touching each other and sear for about 45 seconds on each side until nicely golden. Do not over cook them or they will become rubbery. Transfer the scallops to a plate and keep warm. Take a step back and pour the rum into the pan. Use a silicone spatula to scrape all the brown bits from the bottom of the pan and pour in the orange juice. Bring to a simmer and allow the sauce to reduce by half, about a minute or so. Remove from flame and stir in the cold butter until melted. Taste the orange sauce and adjust seasonings with more sea salt. Add the roasted garlic cloves to the sauce if desired. Transfer the scallops back into the orange rum sauce and squeeze the lemon all over the top. 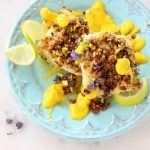 Sprinkle with the parsley, some orange zest and serve over a bed of polenta or butternut squash puree garnished with the orange slices. 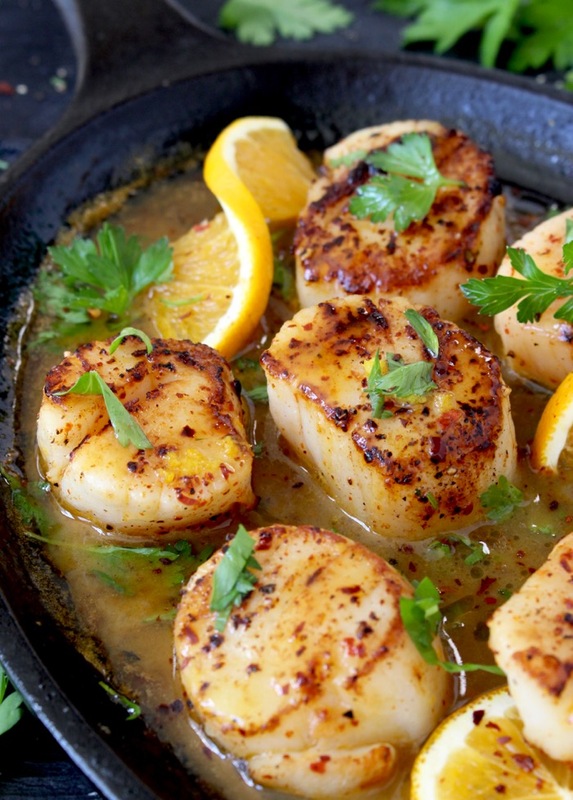 Cast iron is the secret to perfectly seared scallops, I can’t live without mine! These look amazing Florentina! 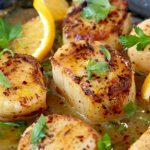 I love scallops, but have never cooked them at home! Scallops are some of my favorite things on the table. Your pictures and sear are amazing! Those scallops! Swoon! We’re lucky to have some of the world’s finest scallops on our doorstep (I’ve even tried them raw as they were being landed!). 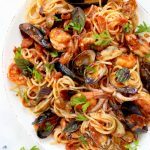 Gorgeous recipe, this! Wow, lucky you! I’m so jelly! I just get them at the market when in season. I love scallops. Or should I say I can’t live without them. I have never tried making them with rum though. Thanks for the awesome idea! A silky orange rum and butter sauce. Exchange Orange for lemon, lime, or other citrus fruit as desired. Instead of red pepper flakes/chili powder, use 1-2 small peppers of your choice, grilled to remove skin. Keep or discard seeds as you wish. Drizzle the garlic with a little olive oil and sprinkle them with sea salt, chili powder, red pepper flakes and freshly cracked black pepper. Toss to coat well. Preheat a cast iron skillet on medium flame until hot. Add a lug of olive oil, just enough to coat the bottom and sear the garlic cloves until golden on both sides, making sure not to burn them. Take a step back and pour the rum into the pan. Use a spatula to scrape all the brown bits from the bottom of the pan and pour in the orange juice. Bring to a simmer and allow the sauce to reduce by half, about a minute or so. Remove from flame and stir in the cold butter until melted. Taste the orange sauce and adjust seasonings with more sea salt. Add the roasted garlic cloves to the sauce if desired, or strain through a metal mesh strainer to make a smoother sauce. Unstrained sauce will become more flavorful over time, if not used right away. Use immediately, or refridgerate until use. Keeps…? This looks wonderful. Being from Nova Scotia we eat scallops often. I’m so pleased to find a new recipe. I always season all seafood with chili. It’s a great balance to the sweetness. The tips on drying and a cast iron pan are spot on Florentina.